Billionaire Bitcoin bull Mike Novogratz announced a multi-million dollar foray into the crypto-lending sector, predicting that the total cryptocurrency market capitalization will exceed $800 billion in the next 12 months. Novogratz, who previously predicted a market cap of $800 billion by the end of 2018, adjusted his bullish stance on the future of the cryptocurrency market in light sluggish market movement in Q2 2018. The Galaxy Digital founder, however, has retained a positive stance on the future of cryptos, spearheading a $52.5 million fundraising round for crypto-based lending platform BlockFi. 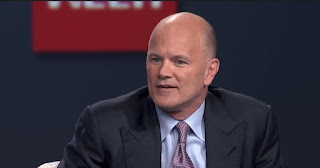 Novogratz, the CEO of cryptocurrency investment firm Galaxy Investment Partners, highlights the growing rate of adoption, emphasizing the rapid rise in employment opportunities within the blockchain sector and the increasing number of blockchain conference attendees. While Novogratz predicts a delayed large-scale institutional entrance the billionaire venture capitalist’s investment arm, Galaxy Digital, is not averse to diving head-first into the crypto startup ecosystem. Galaxy Digital is currently leading a $52.5 million fundraising round into BlockFi, a New York-based platform that aims to provide USD loans backed by cryptocurrency collateral. In addition to the recent investment in BlockFi, Galaxy Digital has invested $15 million into New York-based tokenized asset platform AlphaPoint. Should Novogratz’s predictions for an $800 billion crypto market cap prove true, the Galaxy Digital CEO stands to gain significantly as Novogratz has 10% of his net worth in cryptocurrency, including Bitcoin and Ethereum.